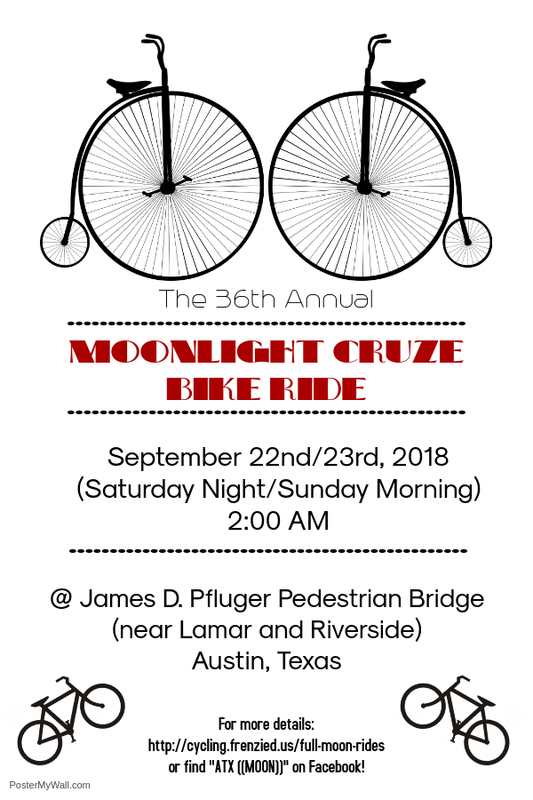 It's that time of year again, and the ride you've been waiting for is coming ... the 36th Annual Full Moon Cruze bike ride! This year, the ride will happen on Saturday night/Sunday morning, September 22/23rd, 2018. Assemble at about 1:30 am at the James D. Pfluger Bicycle and Pedestrian Bridge and we'll ride out at about 2:15 am to 2:30 am. If you only make one bicycle ride a year -- this is the one to make! Here's a bookface event if you're into such things.